Across the world, 24 October marks the anniversary of the UN Charter from 1945. In the 73 years since that day, the UN continues its actions to promote global unity and peace, working to prevent conflict through peacekeeping operations. The UN’s work has grown to include other global challenges, such as sustainable and social development, which are the focus of the Sustainable Development Goals (SDGs). The SDGs are 17 global goals for sustainable development set by the UN. They were officially adopted by the 193 UN member states in September 2015 as part of the 2030 Development Agenda. The goals address global challenges related to issues of poverty, inequality, the environment, peace and justice. CBS actively works with the SDGs in its organisational and education activities, from the partnerships and collaborations it partakes in to the degrees and courses it offers its students. Find out more about CBS’ work with the SDGs in the latest Sharing Information on Progress report and learn more about the SDGs on the UN’s website. 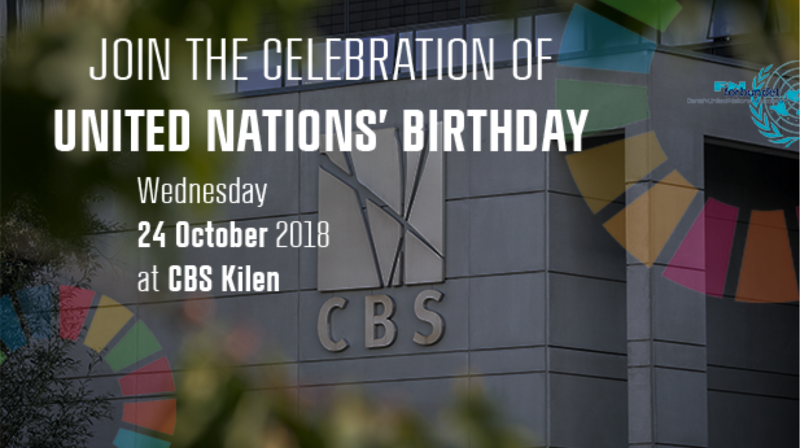 Mogens Lykketoft, former Minister and Chairman of the UN General Assembly, and Steen Hildebrandt, SDG Promoter and Adjunct Professor at CBS, will deliver the keynote speeches for the event. Then, the Sustainability Influencers will deliver a presentation on the SDGs from a youth perspective. Mayor Jørgen Glenthøj will then talk about the implementation of the Sustainable Development Goals in Frederiksberg Municipality. This be followed by song and music. Finally, SDG 15 ‘Life on land’ will be observed in a tree-planting with the mayor, followed by concluding words by Ditte Ingemann from the Danish UN Association Copenhagen. Afterwards, all guests are invited back inside for a reception with refreshments. The event takes place at the Wedge (Kilen) from 13.00 to 15.30 on 24 October 2018. All CBS students and faculty are welcome to participate in the event, which is free of charge. Please sign up for the event by writing to Liselotte Skovsgaard Jessen, lsj.ls@cbs.dk, CBS President’s Office.